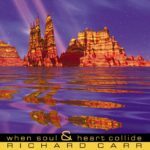 When Soul and Heart Collide is a very adept title for this fourth release from New Orleans by way of St. Louis pianist Richard Carr. He definitely puts both heart and soul into the wonderful music on this recording. Combining elements of new age, classical and light jazz into his own delectable hybrid, it is easy to see why he is becoming one of the most respected pianists in the Big Easy. Richard Carr’s distinctive and evocative piano solos are finally receiving the recognition they deserve. Too many pianists in this genre feel the need or are pressured by labels to add synth tracks to “colorize” their music, but when a pianist plays with this kind of passion, all of the colors of the rainbow are already there. Carr’s music speaks volumes about the artistic merits of staying independent and in control of ones own music. This is Carr’s fifth album to date, and he just keeps getting better. Many of the tracks are first-time improvisations and the album is presented without edits to preserve the integrity of the moment that the music was created. The musical moods conveyed in this CD are varied, from the impassioned title track to the sweet and gentle “Tender Love”. The collection opens with “Familiar Stranger” – a light and upbeat piece of musical sunshine. “Sunbeams At Twilight” is darker and more abstract – less rhythmic and more atmospheric.”When Soul and Heart Collide” starts out gently and gradually builds momentum and emotional power. This is definitely a man at one with his piano, and the piece is exceptional in its openness and strength. “Racing Hearts and New Love” is pure joy. “In Memoriam” is a loving tribute to a trusted friend and mentor. Although much of this piece is sad and reflective, there is an underlying current of hope. At a little more than seven minutes, many musical ideas are able to develop and evolve into other themes – much as emotions often quickly change with the loss of a loved one. This is another truly exceptional piece of music. “Into the Sunset” is both reverent and majestic – almost anthemic. The final track is a duet variation on the title song with pianist Alex Uttermann. This version is also very effective and quite different from the solo – a compelling musical dialogue. This review appeared in Offbeat Magazine in the January 2001 issue. Offbeat is a monthly music & entertainment magazine published in New Orleans. “Richard Carr’s piano concerto-style music evokes the beautiful imagery of his song titles. The romanticism of his earlier releases, Through the Mind’s Eye, Fogland, and An American Quixote, continues here, on 13 original tracks recorded earlier this year at Tulane’s Dixon Recital Hall. With such titles as “Sunbeams at Twilight”, “Headlong Into the Wind”, “Chasing the Dream”, ” Into the Sunset”, “Flying Amongst the Clouds” and ” Rainshower at Mirror Lake”, there’s no mistaking Carr’s intent to convey these ethereal images. Unfortunately, there’s an agonizing sameness to most of these tracks that make them virtually indistinguishable from one another. Carr may know what he’s trying to say but an audience might not – at least not without constantly referring to the song list. Perhaps the greatest flaw here is Carr’s one-dimensional P.O.V. As we all know, life isn’t all sweetness and light and the best music of our Western culture reflects that . Handel was a master composer because his music could conjure up a full spectrum of visual images and emotions – from the wrath of God in unleashing plagues upon ancient Egypt to the triumphant joy of Jesus’ birth. “Autumn Leaves” is a keyboard classic because you can envision leaves falling off the trees as you listen to it. Return to When Soul & Heart Collide album page.